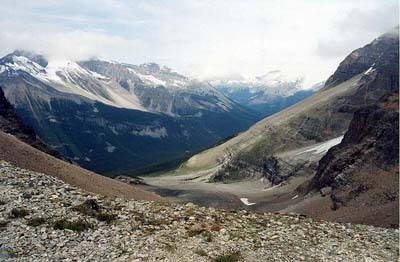 August 2002: The trail and the private road to Lake O'Hara follow Cataract Brook from near the Trans-Canada Highway. Cathedral Mountain, 3189 m, is across the valley. The Alpine Circuit's highest point is at Wiwaxy Gap, 2530 m, but the route does no t cross to the other side of the gap.